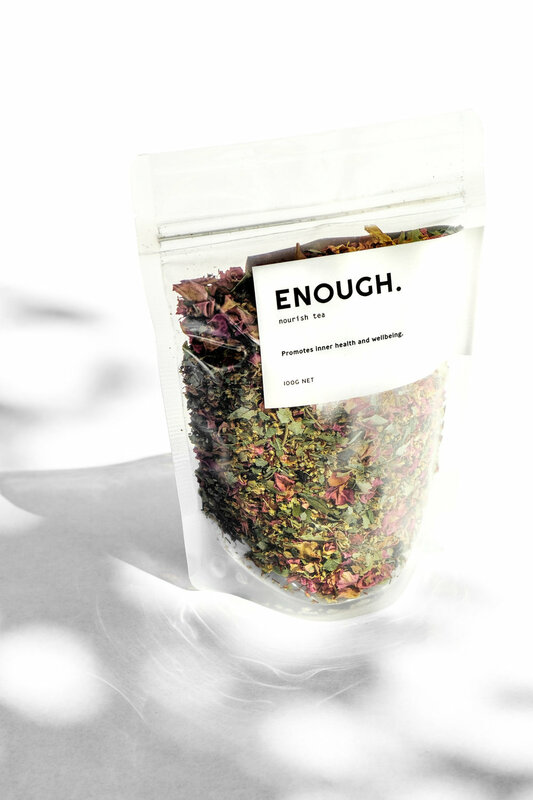 To mark our first anniversary - we launched the Enough Studio tea range, a product that aligns with our values; and encourages and supports your journeys in self-care and nourishment, in and beyond our studio space. Enough’s own Signature Beauty and Limited Edition Nourish Tea, the result of many hours of research and development, and designed to nourish you from the inside out. Our teas are served during your appointment and available for purchase in the studio in 100g quantities. Our Signature Beauty blend is very special to Enough. A detox tea that promotes healthy hair and skin from the inside out. The grounding and earthy flavours of fennel, rose hip dance beautifully with the hair and skin detoxifying herbs of cleavers and burdock, facilitating waste elimination ad preventing further build up of toxins. These herbs have been chosen to help in the removal of waste from the liver and kidneys to improve overall health to the body and hair and skin. Our Limited Edition Nourish Tea is a refreshing blend that can be served hot or cold. Either way, this tea will nourish you with anti-oxidants that support the digestive system, by infusing the energetic flavours of lemon verbena and rooibos to balance the floral sweetness of rose and elderflower to make a lovely uplifting blend. Together with the stress-relieving schisandra and immunity booster, linden - this tea will truly nourish you from the inside, out.